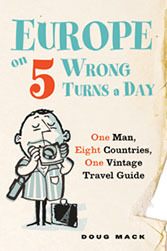 Around Europe with a 1963 guidebook. What could go wrong? 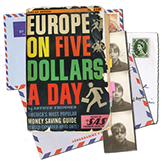 When Doug Mack picked up a 1963 edition of Europe on Five Dollars a Day, he stumbled on an inspired idea: to boldly go where millions have gone before, relying only on the advice of a travel guide that' was nearly a half-century out-of-date. Add to the mix his mother's letters from her own Grand Tour in the late 1960s, and an exploration of the odd and unexpected history of guidebooks and tourism , and the result is a funny and fascinating journey into a Brave New Old World , and a disarming look at the way the classic tourist experience has changed--and has not--in the last generation. 2009. It leads here. Yours truly, mildly inept traveler, using those letters and that guidebook for my own Not-So-Grand Tour. Send me a postcard or come to a reading to get one. More than forty different bookmarks--collect 'em all!